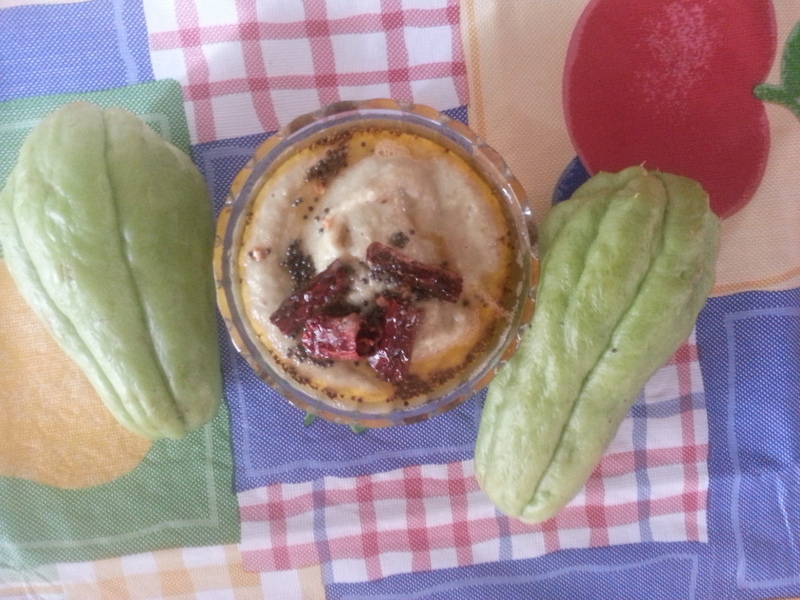 Chayote or Chow Chow Chutney (also known as Bees Gojju or Sauce) is a Side Dish that is generally used along with Starters as well as Main Course. Wash Chayote. Peel the skin and chop it into pieces. Boil it for 5 min. along with green chilly, salt, tamarind paste, sticks of coriander leaves and water. Switch off the burner and let it cool. Grind it with raw grated coconut. Now transfer this to a bowl. Heat oil in a small skillet. Put mustard seeds. When it crackles, put red chilly pieces and finally a pinch of asafoetidabefore pouring it on to the ground mixture in the bowl. Chow Chow Gojju is now ready.